Are you suffering from recurring stomach upset, indigestion, bloating or vomiting? There’s a good reason you shouldn’t ignore it. 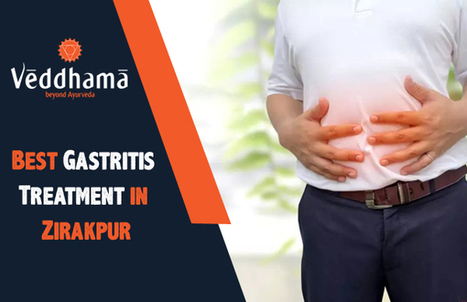 You could be suffering from gastritis.At Veddhama, we imbibe the basic principles of Ayurveda by considering each individual and their Ayurveda treatment Chandigarh as unique and treat each disease from all perspective. Although symptoms like stomach upset, bloating and indigestion are common in those who regularly resort to spicy, junk food and absolutely do not care about their eating habits, these symptoms can often imply a deeper problem like gastritis. Gastritis is a form of inflammation that affects the mucosal lining of the stomach. It often starts as an irritation that can occur suddenly or gradually progress. It often starts as an irritation or that over time can lead to chronic inflammation. Amla –pitta can be considered under, Gastric problems/ Hyperacidity / GERD /Heartburn/Acid peptic disorder. Gastritis is an inflammation, Irritation or erosions of lining of stomach caused due to abnormal secretions of gastric and pancreatic enzyme. Blood in vomit or in stools– if inflammation is causing the stomach to bleed this can appear in vomit or as the blood travels through the digestive system, stools can appear black and tarry. ViruddhaAhara : (Incompatible foods), DustaAhara ( Polluted Food ) , AtyamlaAhara(Sour substances), VidahiAhara (Spicy food), PittalaAhara (Pitta prakopakaAhara), Increased PittajaAhara and Vihara (Habits)- Improper sleep , lesser intake of food ,dry food , untimely food , repeated food intake. Langana :Abstinence from food is called Langhana. Snehana : Intake of medicated oils /ghee. Svedana : Fomentation given prior Vamana procedure . Vamana: is given after the snehana&svedana. Vamana is nothing but emesis. Vomiting is induced by giving medicines to rectify the doshas present in upper Gastro Intestinal tract. Conservative line of management is followed , if patient is not fit for panchakarma , PatoladiKwatha , Hingwastakachoorna , EladiKwathaetc using , can be prescribed. As in ayurveda, Amlapitta/Gastritis, is considered among one of the Pittajadisorders , Diet plan which is followed in Pittaja disorders goes the same . Lavana- Amla ,Katuka – Foods with salty sour & and pungent foods .